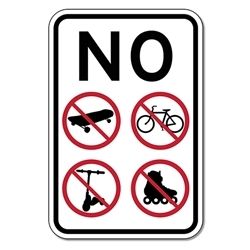 Available in a larger NO SKATEBOARDING BICYCLING ROLLERBLADING SCOOTER RIDING - 18X24 Sign size, recommended for larger parking lots or when the sign is displayed 7 feet or higher above ground. Use this No Skateboarding sign to deter unwanted skateboarding, rollerskating and rollerblading, bicycle and scooter riding on your property. Skateboarding is not a crime, but trespassing on private property or violating municipal codes banning skateboarding in public areas are illegal activities. Skateboarders and rollerbladers can pose a safety hazard to pedestrians, and to customers, visitors, and residents.